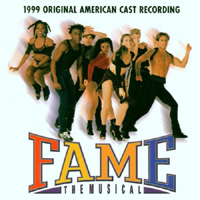 Original American Cast, 1999 (DRG) (1 / 5) Despite the inadequacies of Fame as a stage musical, the first American touring production did boast some top-notch talent. Gavin Creel, Jennifer Gambatese, Kim Cea, Nadine Isenegger, Robert Creighton, Clyde Alves, and Natasha Rennalls are among the cast members who went on to bigger and better things. They make the most of the material, and some credit goes to Jo Lynn Burks for her musical direction; this recording has more energy than the London cast album. But since it features the same insufferable songs, that makes little difference. Creel and Gambatese’s numbers come off well, and Rennalls is fine in the title track and in her falling-apart number, “In L.A.” As with the London cast recording, “These Are My Children” is a relative standout, here sung with heartfelt passion by Regina Le Vert. — M.M. Original Off-Broadway Cast, 2003 (Q Records) No stars; not recommended. 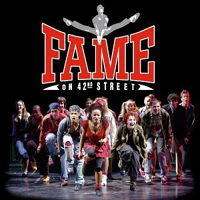 When Fame finally landed in New York, it played at the Little Shubert Theatre and was renamed Fame on 42nd Street — as if a title change would save it. But no time was spent fixing the show’s ridiculous lyrics and trite sentimentality. Unlike the other recordings, this one boasts no exceptional cast members. Cheryl Freeman tries hard but can’t make much of anything out of “These Are My Children,” though her duet with Nancy Hess in “The Teacher’s Argument” has an energy that previous renditions lack. Nicole Leach’s Carmen is decently sung but somewhat lifeless, as are most of the other performances. Two items of note: This disc includes music for a second-act pas de deux, and a “Romantic Suite” of songs from the show performed by the Budapest Symphony Orchestra. 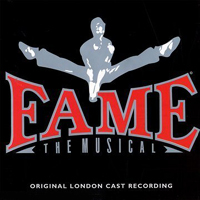 These tracks suggest that Fame might be a much better show if it were only danced and not sung. — M.M.